James Frye declared himself to be “An Artist!” when he graduated from High School. Wouldn’t it be something to just know your life work begins “Right Now!”? Wouldn’t it have been something more to know how you would be leaving your boldest thumbprint on the world so young? Visual artist, James Frye, hand sketches wildly, vibrant, electronic documents in an abstract style that are transferred to canvas for hanging. James is a Synesthetes, he has the ability to hear colors. 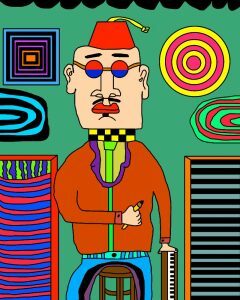 Heavily influenced by his fathers love of vintage vinyl records, he has been listening to bands such as The Beatles, The Rolling Stones, The Who, and other popular bands from the 60’s and 70’s – and his art demonstrates this. Progressive in his form, channeling a different era, a true “Futuristic Throwback”. With his art, James moves beyond perceived communication limitations – he names his pieces very thoughtfully, and it is within these titles, where the words are, that is the place wherein the artist communicates.